Well, back again after some time off the air. Just after my last blog we had a disastrous fire in the adjacent shed, the shed was a total loss including the 10 finished and partly finished boats, moulds, resin, catalyst, acetone etc,etc,etc. Half of our tool collection was also in this shed, everything went up. The flames and heat licked the shed where I am building the Scarab 32 and it was an absolute miracle that the 32 escaped, the shed has 4 glass window panes which were all smashed from the heat. The 32 floats were outside covered with multiple tarpaulins, quite a lot of the tarps were melted away exposing the fibreglass. In my last blog I said the interior was almost finished, I have since added horizontal shelves to the sides, a shelf for the portable fridge and platform for the portapotti. The inside has been polyester Flo-coated white, applied with a mohair roller. 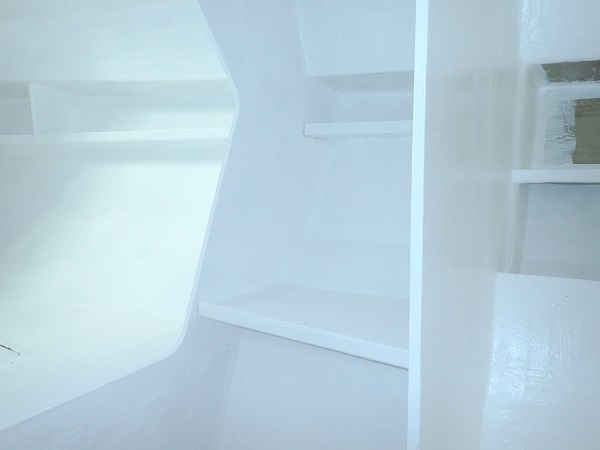 Previously the inside of boats that we have built have been painted with various house paints but I wanted something more durable for this boat. 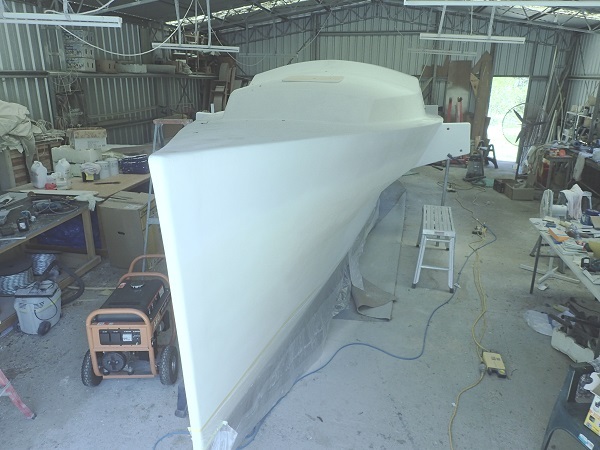 Also if any modifications need to be made or additions laminated on, the polyester flo-coat will be easier to prepare than grinding paint back to the fibreglass. One more coat of flo-coat is required and the areas around where the chain plate bolts will be also needs to be coated. I have had the chain plates and the mast posts (two for the schooner rig) made and the posts will be set up and fixed soon. The cockpit was next on the list, filling with Q-Cells and resin and sanding back ready for priming. 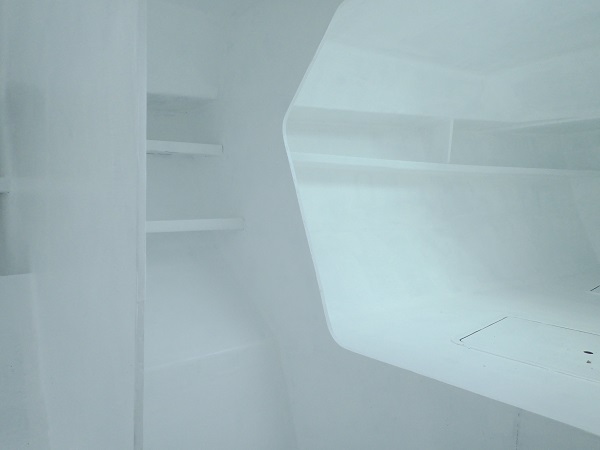 This last 2 weeks I have been busy painting the exterior with Jotun Penguard High Build Primer using a Wagner airless spray gun, was going to use a brush and roller but after one coat in the cockpit I decided that it might take almost forever to do it that way. Inside the lockers worked well with a brush and roller but for large expanses not so well. I used the hand held model which holds 800 ml, the gloss final coats will be applied with a Wagner direct feed airless sprayer and am hoping the results will be acceptable. 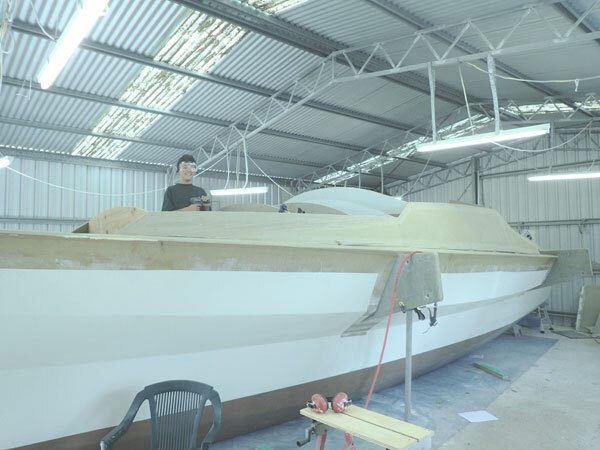 The small airless don't seem to be much good for the final gloss coat after spraying the whole boat with the HB Primer, the primer has the gun working very hard. One problem when painting the deck and cabin while standing on the side deck is that you can't stand back to admire your work, it's almost 2 metres down to the floor. 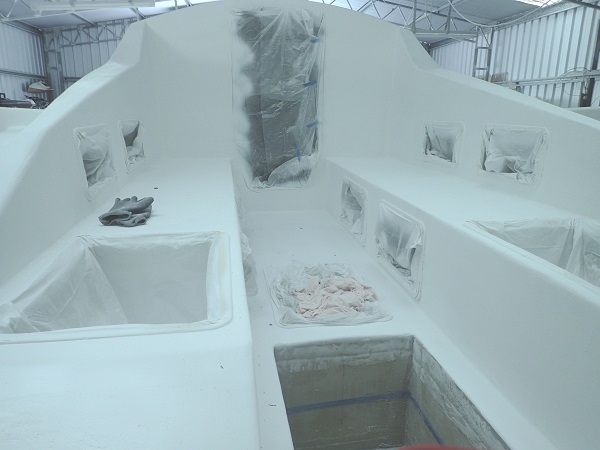 It's a great and inspiring feeling to see the whole hull (except for the anti-fouling) painted one uniform colour covering up fibreglass tapes and bog filler. Hi, I will bring you up to date on the Scarab 32 Prototype. The cockpit is finished, interior almost finished and all of the deck and cabin is just about finished. 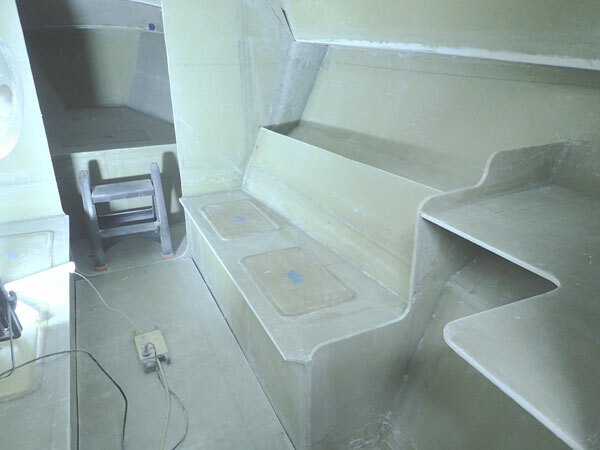 I am preparing and taping the inside of the cabin / side deck joint, Taping the side deck / hull joint on the inside and taping the cabin top to bulkheads 3A and 4. 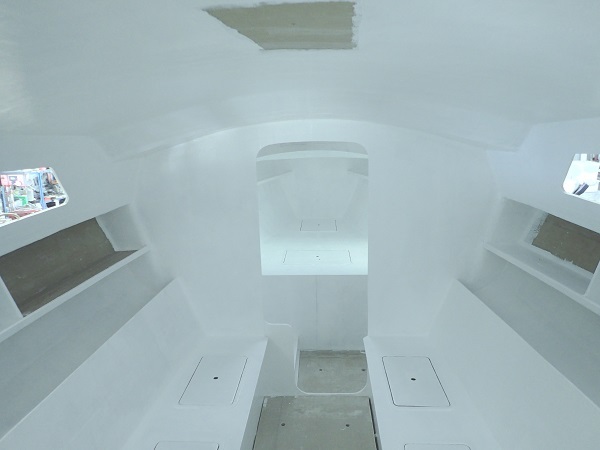 The forward bunk is complete as are the settees in the main cabin. 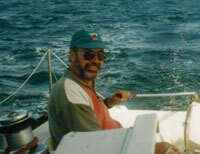 The galley shelf is complete on the starboard side and the navigation shelf on the port side is also complete. The sink and stove (Origo single burner metho) have been purchased but the sink has not been installed yet. 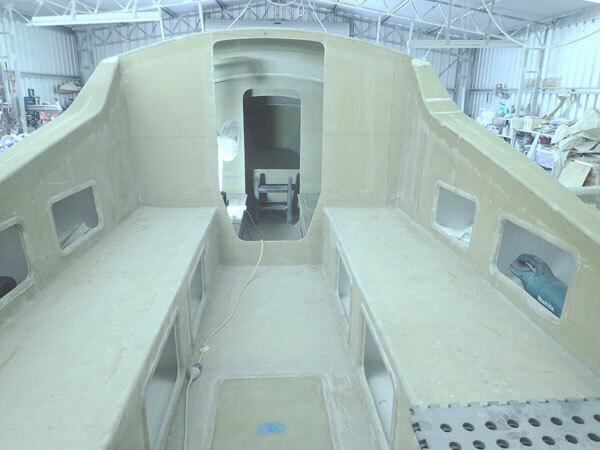 The curved panels for the cabin roof were made using foam that had been glassed both sides, saw cuts were made through the top layer of glass at 50mm spacing and just more than half way through the foam using a diamond studded blade in a small circular saw. 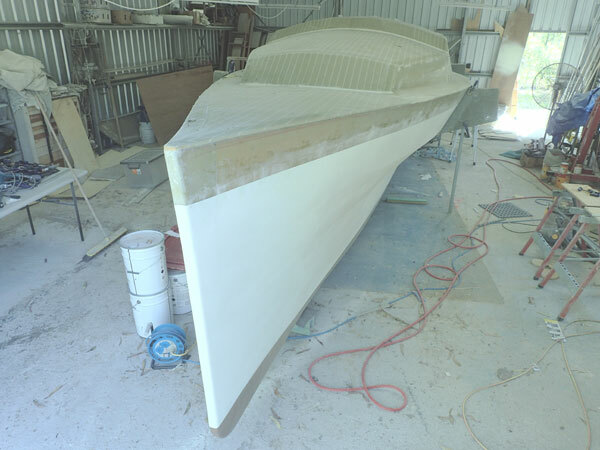 A batten mould was then constructed to the correct curve to correspond with the tops of the bulkheads. 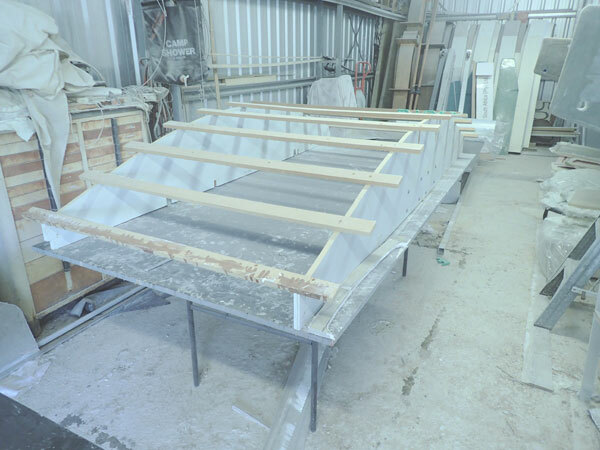 The sheet was then draped over the batten mould, the saw cuts filled and the top covered with double bias glass, four of these panels were made and placed on to the top of the cabin sides. After trimming and taping they look great. The big 150mm Makita Random Orbital sander will be working soon on the filled deck, cabin and cockpit. Ash - A willing helper. Made a decision a few weeks back to not have a sliding main hatch, I had been entering and exiting the cabin without an opening in the cabin top without any trouble and decided to save lots of time by not making a sliding hatch. I am 6 foot (1.8m) tall so most would be able to use this approach. 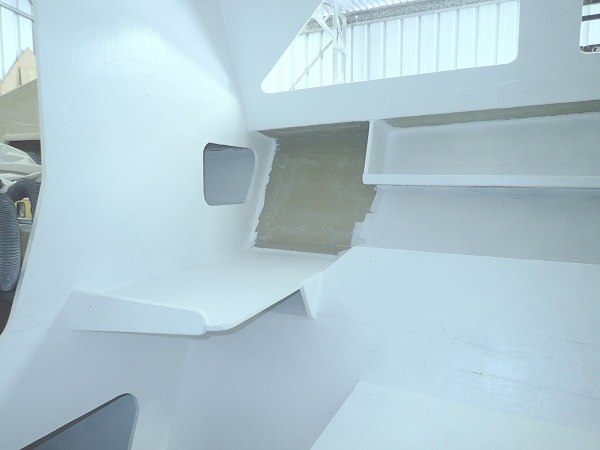 All of the access hatches in the bunks, settees, cockpit seats and cockpit risers have been made using moulded frames and moulded lids, this improves the appearance (gives a nice consistent look) and simplifies building. Most builders will know that it doesn�t matter how careful and precise they are in marking out and cutting openings the lids will only fit one way and cannot be used on the adjacent opening. The moulded frames and lids eliminate this annoyance. The windows will be set in similar frames glued to the cabin sides and this should make the windows leak free. I have ordered the folding system and hope the fabricator can build it soon, the arms are water jet cut stainless steel and there will be a few welded spacers to complete each item. It is so hot here this summer, most days the temperature in the shed gets up to 40 deg in the afternoon so all work with resin has to stop. In fact I took the last 2 weeks off because of the heat and finished off the drawings.